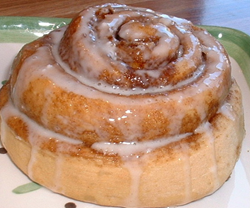 Come Meet the New Owners of House of Bread Wasilla and Enjoy a Cinnamon Roll On the House Saturday April 12th. Jamie and Grace Collins, the new owners of House of Bread Wasilla will be handing out cinnamon rolls on Saturday April 12th to the first 200 guests. Now that’s what we call a meet, greet and eat-good time! Jamie and Grace are enjoying getting to know all their customers and delivering the very best customer service and product quality. “Having grown up in a small town in Montana, I understand the need to deliver excellence to earn the good will and trust necessary for a neighborhood bakery to flourish” said Jamie. “Grace and I are a little anxious about the baking end of the business as we are not bakers by trade. However, we know good food and will not let anything less than perfect go out the door.” Please stop by and take advantage of ample on-site parking to stop by for a quick breakfast to-go, or make use of comfortable dine in seating to enjoy gourmet coffee or a high-quality lunch. Sheila McCann after practicing law for six years, opened the first House of Bread Bakery Cafe in San Luis Obispo, Calif., in 1996. In 2002, she began a national franchise program that has expanded into six states. All House of Bread Bakery Cafe recipes rely on fresh, high-quality all natural ingredients. For more information, please visit the website at http://www.houseofbread.com.